ProjectSend’s install process is meant to be as simple as possible. If you’d rather not mess with databases and FTP connections, many hosting providers allow 1 click installation via software managers like Softaculous, which are generally available on your control panel. For a manual installation, the following steps should take you no more than a few minutes. You will need FTP access to your server. If you don’t know your credentials, please send a ticket to your hosting provider requesting them. An FTP client program. FileZilla is a great choice. Access to create a MySQL or mssql database and a user for it on your server. Generally it’s through a panel provided by your hosting. Optionally, a text editor can be used to manually edit the configuration file. However, ProjectSend offers a pre-installation step that does this for you via web. memory_limit at least on 64M, but 128M is recommended. post_max_size and upload_max_filesize at least on 20M. 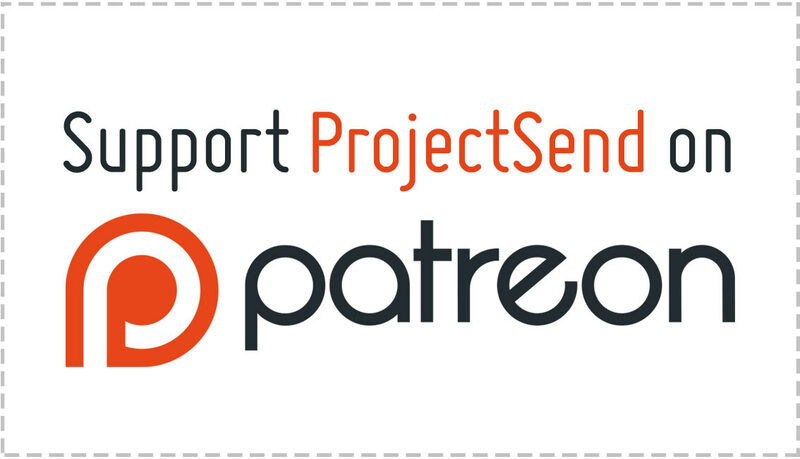 Download ProjectSend’s latest official version. Unzip the downloaded file on your computer. Create the database on your server, and a user for it with all available permissions. Have the database name, username and password handy, you will need them later. OPTIONAL STEP: navigate to the includes folder and make a copy of the file sys.config.sample.php. Rename it to simply sys.config.php and edit it. DB_NAME: the name you used to create your database. DB_HOST: generally it’s localhost or 127.0.0.1 but it depends on your server’s configuration. DB_USER: the username that you created previously and assigned to the database. DB_PASSWORD: the password you set up for the user. TABLES_PREFIX: for added security, use a custom prefix consisting of only letters and numbers. Ideally end the name with a _ to make it easier to understand. SITE_LANG: the language that will be used to load the translation files. More information on languages. MAX_FILESIZE: the default maximum size per file that will be allowed to upload, in megabytes. By default it’s 2048 (2 gigabytes). You can skip this step if you want and complete all this information on the online installer later. – If you want to run PS from https://www.yourdomain.com the files need to be on that folder. Just upload the files inside the primary directory from the download, instead of directly uploading it. Visit via your browser the location of ProjectSend. You will be redirected to yourprojectsendlocation/install, and the installer will then run for you. You can complete the first step with the database information if you haven’t done it manually before. You will then be prompted to define a name for the site, a username, password and email for your first administrator user. One more click and the installer will then proceed. After that you will be shown a message indicating that everything went well and that you can now log in into the system. That’s all! Enjoy your new file sharing platform! Some AMAZING users have published installation tutorials on their websites and even videos of the process on YouTube. Feel free to check them out if you need a more visual guide.